Do you have a Labor Positions Chart in your Doula Bag? Labor Positions Charts – These include 6 illustrated, laminated positions charts for labor with over 200 positions. Rebozo Positions Charts – These include 45 pictures representing 26 different positions using the rebozo. These demonstrate positions for pregnancy, labor, pushing, and postpartum. 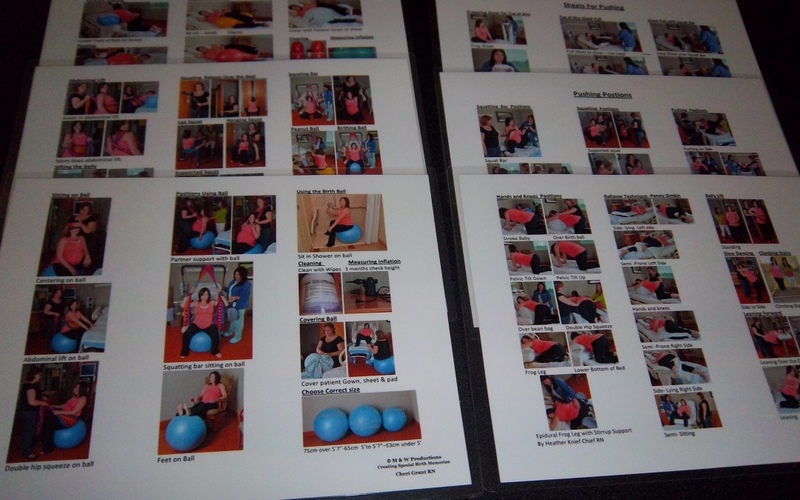 Birthing Ball Positions Charts – These include 25 pictures representing 12 different positions using the birth ball. These demonstrate positions for pregnancy, labor and pushing. Positions for Asymmetric or OP (Occiput Posterior) chart– This chart Includes 43 pictures representing 22 different asymmetric positions for OP and acyclintic babies. Labor/Pushing Positions chart– This chart includes 44 pictures representing 19 different positions for labor and pushing. Sheets for Position chart– This includes 21 pictures representing 5 different positions using a sheet. This chart includes the newest technique using a sheet, the Lugrand Sheet Pull. Premier Birth Tools offers a wide array of exceptional, professional items for doulas, nurses, childbirth educators, midwives and doctors to educate laboring mothers and other professionals and to do their jobs more effectively. Visit the Premier Birth Tools Store for Labor Positions Charts and much more!